Set in "Ward 22" during the Angola Bush War that raged from 1966 to 1989 in South-west Africa, with evocative realism, Moffie transports the reader into the world of a young gay conscript ironically defending a regime that actively supresses his identity. Nicholas van der Swart has always known he is different. Unable to live up to the expectations his family, his heritage and his culture have of him, he grows increasingly diffident and introverted. When, at the age of 19, he is conscripted into the South African army, he enters a world that is utterly at odds with his every sensibility. Here, he will face the scorn and violence of his tormenters, but will also find the strength to survive. Although the Truth and Reconciliation Commission in South Africa has gone a long way toward exposing and exorcising some of the atrocities committed in the name of Apartheid, very little has been revealed about the adversities faced by gays under the regime. 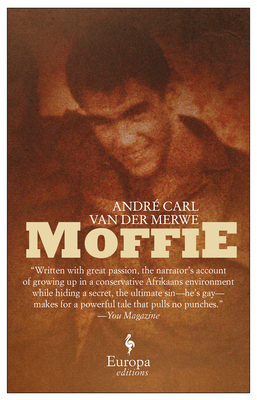 At turns heart wrenching and humorous, told with great sensitivity and infused with hope, Moffie is a long overdue account of a vital subject, place and time. André Carl van der Merwe was born in Harrismith in the Free State, South Africa. When his family moved to Cape Town, after two years of national service, he started studying fine art in Cape Town and later founded a clothing company, which he owned and ran for the next fifteen years. Today he concentrates on architectural and interior design and writing. "I can't remember another book in recent times that is written with as much passion, grit, and unexpected tenderness." "moffie is a novel I highly recommend to serious readers."